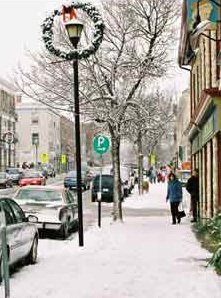 On Saturday November 26, 2011, at 10am Perth comes to life with the Annual Festival of Good Cheer, sponsored by the Downtown Heritage Perth – BIA. Holiday shoppers will be transported back to the Victorian era and entertained by the Perth town crier, carollers and music groups around town. The museum will feature cider and cookies by the fireplace in the 1840 kitchen and seasonal music will play throughout the house. A Christmas shopping fare will take place in the Crystal Palace. The day will also feature discounts and demos at your favourite downtown stores, wine tasting at The Stone Cellar, live music in the sun-filled atrium at Code’s Mill and meal deals at select restaurants. Some restaurants will feature dinner and theatre packages that include a delicious meal plus a ticket to A Month of Sundays, the heart-warming comedy by Bob Larbey that on stage at the Studio Theatre all that weekend. For further information please contact Heather Hansgen of the Downtown Heritage Perth BIA: 613-264-1190. Don’t miss the evening fireworks and community tree-lighting ceremony at the Tay Basin the night before. The best of summer…three days of great music in a magnificent riverside park. It’s definitely worth the drive to Perth this weekend to enjoy this delightful FREE, family-friendly festival. Don’t miss it! While you are visiting the Stewart Park Festival, be sure to drop by Ground Waves (located in Code’s Mill). They are offering $5 off purchases over $25 during the festival. Click Here for printable version of coupon. Join us for the 21st Stewart Park Festival! 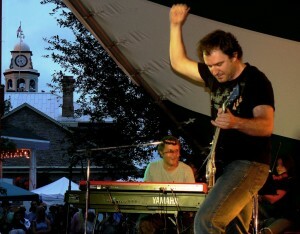 For more information on the show times and performances visit www.stewartparkfestival.com. It’s that time of year again… spring has popped up it’s lovely head which means it’s time for the Annual Festival of the Maples. This year we will be celebrating the 35th year! This event in downtown heritage Perth is a favourite for the entire community and visitors alike. The Perth & District Chamber of Commerce presents this annual festival on April 30th, 2011 on the streets of downtown Perth. This Perth event takes place from 8am to 4pm and includes activities such as: musical entertainment on the street, food vendors, maple syrup judging and sales, craft and artisan vendors on the street, displays of cars, kids’ activity centre in the Basin and lots more! 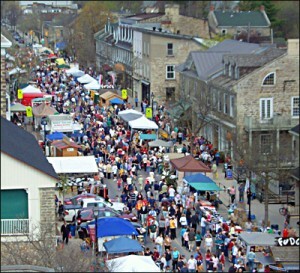 Come celebrate the end of the maple season in Lanark County.